Greg Clark friend or foe for renewable energy ?? Will Teresa May support the UK’s status against Climate Change and Renewable Energy ? make up your own minds and whenever possible press your MP for greater support. Keith Wheaton Green speaks with such personal understanding and eloquence regarding our continued Denial of the most obvious. Is it really just total selfishness by a few who hold back everyone of us and generations to come after us ?? Someone in denial obviously can’t see the truth even when the evidence is all around them. I believe I have only been in denial once in my lifetime to date – when a loved one was dying but I refused to believe it even though everyone around me understood the truth. Obviously, denial has no impact on the inevitable. And so it is with climate change. It can be difficult to accept the truth when it affects cosy lives or world views. Change, or the perception that things will change can be uncomfortable. I think the floods of the last three years, the fact that the 15 hottest years on record were during the last 16 years and the uncharacteristically warm, daffodil blooming December 2015 has led to the penny having dropped. Dorchester seems to have a surprising wealth of well-informed people. However, the planning establishment are wedded to the concept of “landscape harm” and their professional (?!) opinion was that this outweighed the benefit of renewable energy generation. The case officer spent most of his presentation time explaining that harm, with only a passing mention of the schemes benefits. I would say he was in denial of the benefits and the degree of public support. He was not alone. One speaker erroneously stated that there had been no global warming since 2000 and that wind turbine saved no carbon emissions because of the back-up generation required. There were many other statements made that were simply not true. Denial of reality to keep themselves in the cosy zone of their imagined reality. Councillors had evidently already made up their minds and voted 6 to 3 to reject the application with little discussion. There is no prospect of an appeal to our wind turbine hating government. Our government is also evidently in denial. Despite David Cameron speaking with apparent passion in support of the firm targets to reduce carbon emissions in Paris, and his statement that Britain was “already leading the way in work to cut emissions,” the current trajectory to reduce UK emissions is dire. Thanks to previous DECC ministers, Eds Milliband and Davey, we did indeed show leadership up until election of our current government. The introduction of the feed in tariff in 2009 and the renewable heat incentive in 2011 led to impressive expansion in renewables. Wind now regularly supplies around 14% of electrical demand (and is not as intermittent as you might think) and photovoltaics show up as a significant reduction of midday demand. (If you don’t believe me, have a look at the excellent gridwatch.templar website where you will find up to the minute and historical easy to understand data.) However, our current government cannot claim responsibility. Removed Feed-in-Tariff (FiT) pre-accreditation and implemented a wholesale review of FiT with expectation that it could be scrapped entirely. Removed tax breaks for small community-led projects. And no one can deny that. one hundred percent in a few years more? Because it will have shut down a whole bunch of the polluting energy sources, and replaced our current electricity supply with something far cheaper? Wouldn’t that be alright? He said “I have just two words for you – ‘I agree.’ “. And then slipped into a kind of precautionary ‘do both’ reply, with which I have no problem whatsoever – though as you are pointing out Keith, the likelihood of our present government legislating to promote the right things seems both microscopic, and receding. He was helpful enough to mention the issue of storage being something we’d have to work on for solar, giving me the opportunity come back and say something about that. Fortunately I had already discussed the issue of storage in the gas grid earlier in the day with a Wales and West Energy guy. Rather than shutting down the gas grid to stop methane emissions – which they recognise has to happen some time – they are already thinking about switching it to hydrogen instead of methane, made from hydrolysis using excess summer solar energy. In Germany, the gas grid has three months worth of national energy demand in storage capacity – so it is already a massive, low cost storage solution. I summarised and shared this information at the lecture, and got another ‘I agree’ from the lecturer, and was shortly afterwards surrounded by students as the questioning ended and the lecture started to disperse, and had a fun chat with some of them. It was very sweet, actually, to find that an old geezer who had been a bit of a nerd for most of his life, could find lots of common ground with today’s young people. And my point is?… Whatever our governments are doing or saying, it is a truism that politicians are at best generalists, and not in touch with real trends and or solutions in areas in which they are supposed to be expert. (And only a truism, not the fiull truth – there are smart politicians, and politicians who aren’t in the pockets of vested interests). But it does make it uphill work talking with politicians. If it’s around getting permission for wind farms, that becomes a problem. But if it’s around putting solar on most roofs that can take it, there’s no need to have that conversation, and eventually they come round to your point of view, because it’s so obviously working, and there’s no way for them to stop you. Except, of course, that by virtually removing feed in tariffs, they have done their utmost to stop solar dead in its tracks, and stop the next tenfold increase in the UK. Which would, incidentally, take us from 8Gw, to 80Gw, which is quite a lot more than our peak daytime electricity demand, and takes us well into the territory where nuclear is long dead (whatever the cleanup cost) and storage has become the issue, and by which time, switching the gas grid from methane to hydrogen will have become a well-discussed and understood topic, and we’ll be working towards it – hopefully. It’s the least cost solution so it should be a no brainer for people owning gas grids to switch to hydrogen. Renewables have already demonstrably caused a lowering of grid wholesale prices, and only solar has the ability to halve its cost again, and then one more time again. Meaning a wholesale price for energy around 1p to 2p per unit? That would be cool, wouldn’t it? Whether we manage to get this to reduce prices for energy end users is up to us – communities have to own the solar generation, and distribution as well, for this to happen There’s no reason why not – or, rather, there’s every reason why not, as it will go against vested interests, and the need for corporations to continually increase profits in a growth economy. SO. In just two diagrams and far less time than it took me to write this, and even less time than it took you to read this (if you’ve been kind enough to do so) we have a complete solution to our energy problems. Abundant, cheap, secure, 100% renewable year-round energy. There’s plenty that could be said to flesh it out, and fill in the evidence base to support the logic, as well as fill in the steps that get us from here to there. But the bottom line is it’s pretty simple, and almost absolutely unstoppable – as with Moore’s law in electronics, it did not need government legislation to get super powerful smartphones in everyone hands, and reduce the cost of storage from £600 for 40 megabytes (my first hard disk drive in or around 1992) to £199 for 8 terabytes (my latest, which would have cost £120,000,000 at 1992 prices). Similarly, government can’t stop the growth of the solar economy, because economics itself drives the change – but government could help the development of the solar hydrogen economy. Once Hinckley C is dead (or, rather, once it is recognised as dead) there’s no reason for government not to go for this. Discuss? Tough about the wind, and cost of nuclear cleanup, but no worries about the long term renewable future. And the ‘long term’ is a lot sooner than governments imagine – see above…” "
Renault has signed a letter of intent with the Dutch Utrecht City Council, ElaadNL and LomboXnet on Smart Solar Charging for electric vehicles. The signature took place during the state visit to Paris of King Willem-Alexander and Queen Máxima of the Netherlands, under the schedule of Franco-Dutch Economic Year 2015-2016. Renault, Europe’s leading electric vehicles manufacturer, and its Dutch economic partners Utrecht City Council, ElaadNL and LomboXnet signed a letter of intent in Paris on 11 March 2016 to develop a Franco-Dutch framework of smart solar charging solutions for electric vehicles. The signature ceremony was attended by Renault’s Laurens van den Acker, SVP Corporate Design and Guillaume Berthier, EV sales Director; in presence of the king and queen of the Netherlands, the Dutch minister of trade, Lilianne Ploumen and the French Foreign Affairs Ministry’s secretary of state for European affairs, Harlem Désir. According to the letter of intent, the city of Utrecht could be the testing ground for the solar smart-charge project. Renault, Europe’s leader in electric vehicles, would supply a fleet of 150 Renault ZOE models through 2017 to the city. ElaadNL would handle management of infrastructures and the smart-charge standard, and LomboXnet would take charge of installing the network of unique public charging terminals powered by a 44 kW grid connection. Grid operator Stedin would be involved to balance supply and demand of the grid. Phase one of the project would involve setting up 1,000 smart solar-charge stations, powered by 10,000 photovoltaic panels in the Utrecht region. Infrastructure installation would run side by side with development of a car-share service of electric cars, powered by renewable energy, for Utrecht residents. The Renault ZOE R.Access connectivity and 22 kW charging make it ideal for car-share and smart charging applications. Phase two of the project would proceed with the partners developing a vehicle-to-grid ecosystem, with the network of solar chargers capable of both charging the electric cars and of feeding energy stored in the batteries of parked cars onto the grid to meet demand peaks. This could be the starting point for a new system storing renewably sourced energy. Through its pioneering work on EVs and their batteries, Renault contributes to the energy transition in the automotive industry by reducing the use of fossil fuels. Renault, through smart charging experiments, increases the proportion of renewable energy EVs use. One of the goals of the Smart Solar Charging Project developed by Renault, ElaadNL, LomboXnet and the Utrecht City Council is to make a substantial contribution to reducing the carbon footprint not only of the auto industry but of all sectors consuming electricity. ElaadNL researches and tests the possibilities for smart charging on behalf of the dutch grid operators. With innovative techniques ElaadNL can charge electric cars in a smart way, exactly at the right moment. With Smart Charging, the abundance of electricity from the sun and wind is used to charge our cars. Live off the wind and drive on the sun! In June 2015, LomboXnet introduced in Utrecht a world-wide scoop: a charging station making Smart Solar Charging accessible worldwide. This charging station can charge and discharge (vehicle-to-grid, V2G), establishing the foundation for a new local energy system based on local energy sources and local storage. The unique charging station is developed in a consortium of GE, Stedin, Vidyn, Last Mile Solutions, Utrecht Municipality and led by LomboXnet. By implementing the vehicle-to-grid project on a regional scale, the region of Utrecht creates – together with partners like Renault – a large living lab for innovative smart grid solutions. This show case implements not only green power, but ensures also clean air zero emissions in the city and region of Utrecht. Thus, Utrecht makes way with Healthy Urban living. Not only to continuously improve its leading position as the most competitive region of the EU (according to Eurostat) but also to inspire other metropolitan regions as well. Renault has been making cars since 1898. Today it is an international multi-brand group, selling more than 2.8 million vehicles in 125 countries in 2015, with 36 manufacturing sites, and employing more than 117,000 people. To meet the major technological challenges of the future and continue its strategy of profitable growth, the Group is harnessing its international development and the complementary fit of its three brands, Renault, Dacia and Renault Samsung Motors, together with electric vehicles, the Alliance with Nissan, and its partnerships with AVTOVAZ and Daimler. As you well know, the hydropower sector has been hit hard by the recent maelstrom of Government policy changes and we now face a very challenging future. Intentional or non, the effects are real and we whilst we have been lobbying both DECC and the Treasury very hard and continue to do so, we have also been working with many MP’s and Peers in England and Scotland over the past 6 months. Amongst others, we have requested meetings with the Secretary of State, Amber Rudd and with the leader of the Conservatives in Scotland, Ruth Davidson. Please pass on to all those within your network and get them to sign as soon as possible. The future of our Planet and what our kids will inherit is now of crucial importance. Renewable Energy is clearly the key energy solution going forward and Wind specifically on-shore wind energy is the most productive source. It harms almost no-one, it even has aesthetic beauty and it delivers energy directly to the people who need it. So its time to ask your MP’s, Local Councillors etc why they don’t give it their 100% backing and to help you support this campaign the Pro Wind Group have produced the following letter. Its extremely well crafted and if you agree with its points I urge you to print it and send it as soon as possible to your local representatives. Its time that the majority had their say !! Congratulations on your recent election to West Dorset District Council. You and the other newly constituted local councils around the country are now in the hugely responsible position of facing a wide range of decisions that can make or break national aspirations for climate change mitigation. The United Nations Development Programme estimates that over 70% of climate reduction measures are undertaken by local government. Climate change is the issue of our times. Indecisiveness now will result in huge costs later. The UK Committee on Climate Change states in its progress report for 2014 that ‘urgent and intensive action before 2020’ would save £100 billion, reduce reliance on imported fossil fuels from politically unstable countries and have a positive impact on energy prices. There is considerable merit in embracing the move to renewable energy purely on economic grounds. According to Regen SW there are already 10,000 jobs in the renewable sector in the SW and this is expected to rise to 34,000 by 2020. Currently about £30 million enters the local economy in the form of feed-in tariffs earned by households and there is potential for more. There are increasing opportunities for people to invest in solar panels on their local school or village hall through organisations such as Dorset Community Energy, a not-for-profit community benefit society. Standard practice for wind farms is to offer an annual community benefit of £5,000 per MW and solar farms £1000 per MW for the lifetime of the project. 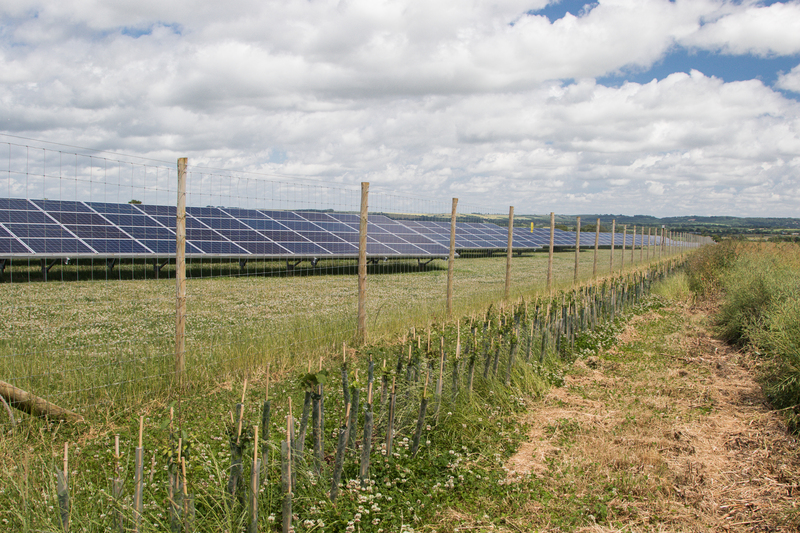 Existing solar farms across 11 Dorset parishes have already agreed a community benefit spend of £2 million. Opponents tend to exaggerate the level of subsidy. Government figures calculate the total subsidy for UK renewable energy to be £38 per household per annum. The costs of the established technologies of solar and wind are dropping even faster than expected and it is highly likely that by 2020 they will be cheaper than other forms of energy and will need no subsidy. The move to renewables in the UK will come. The only question is whether Dorset politicians will assist Dorset in benefiting fully from its huge natural resources of sun and wind. The largest solar farm in the UK is the 60MW farm near Bournemouth airport that is so well screened that most people are unaware of its existence. Corbin Industries in Bridport employs 70 people to make frames for solar panels. However there is still a mountain to climb during your tenure as councillor. Much of the low-hanging fruit has been picked and the challenge is becoming clearer. The Bournemouth, Dorset and Poole Renewable Energy (BDPRE) Strategy sets a 7.5% target for renewable energy generation for 2020. The strategy has been produced by the Dorset Energy Partnership that includes Dorset County Council, all the district and borough councils and a wide range of community groups. The latest figures (March 2015) indicate that 3.4% of total energy consumption can be covered by projects that have been built or are in construction. So we still need to double the capacity in the next 5 years. This really is a minimum since further national targets beyond 2020 are increasingly ambitious. The Dorset Energy Partnership, which includes WDDC, has clearly rejected widely circulated claims by some groups that targets have almost been reached. Last month no lesser person than the director general of the National Trust, Dame Helen Ghosh, made an unequivocal statement that climate change poses ‘the biggest threat’ to the land and houses in the care of the National Trust. She cited loss of biodiversity and wildlife on the land and the already substantially increased flood, stormwater, subsidence and gale damage to properties. She promised that the trust would lead by example in moving to renewable energy generation. The Government’s ‘UK 2012 Climate Change Risk Assessment’ examines threats to the built environment and concludes that the risks posed by sea level rise and higher average temperatures will have a substantial impact by mid-century and that extreme weather events resulting from climate change are already causing substantial damage. It is important to protect our landscape, wildlife and heritage assets for the current generation, but the only way to secure their long-term future is to tackle climate change. You are the tier of government best placed to show leadership and to bring businesses and communities along with you. You are in a position to turn good ideas into tangible results – cooperatives for local energy production are a good example. You will face planning decisions that must be guided by key statements in the NPPF (National Planning Policy Framework) – ‘all communities should play their part in contributing to renewable energy generation’ and ‘local government should design policies to maximise renewable energy’. The BDPRE Strategy is clear that to achieve the 2020 target the full range of renewable technologies will need to be exploited in the form of both small and large scale projects. In particular there will have to be some larger scale, appropriately sited, solar and wind farms in the mix. Developers are aware that the number of suitable sites in Dorset is very limited, in particular because of the extent of the designated AONBs (Areas of outstanding Natural Beauty) and other environmental designations. Most developers consider site selection carefully before committing large sums of money to a project. Councillors need to be clear that if they reject the projects coming into planning in the immediate future they are prepared to accept that Dorset will not reach its target. Dorset people will be refused the opportunity to play their fair part in the national endeavour to decarbonise electricity. The next 5 years offer an exciting opportunity for councillors to make a real difference to our social, environmental and economic future by ensuring that initiatives and planning decisions are firmly focused on the achievement by 2020 of the targets we have set ourselves in Dorset for all the reasons we have outlined above. Swansea’s Tidal Power Lagoon and more….. I attended the Regen South West Conference this week and the most rewarding and interesting talk was Graham Hillier on Tidal Lagoon Power. If you have the time take a look this weekend at this amazing technology and plan that can light up the UK, reduce the use of fossil fuels and clean up Britain. Take a look at this amazing idea. Irony but the future is electric…. Having heard so much good about petrol cars, we decided to test drive one. They are said to combine cheap price with long range and fast charging. A winning formula on paper – but how are they in real life? We sat us in the loaner car at the car salesman’s office. Automakers do not sell the cars themselves, only through independent car repair shops as middlemen. It may sound like a bad omen to buy the car from a car repair shop that you want to visit as seldom as possible. But you apparently can’t buy the car directly from the manufacturer but must go through such intermediaries. The seller was very ”pushy” and tried to convince us to buy the car very forcibly, but the experience is perhaps better elsewhere. So we sat in the car and pressed the START button. The car’s gasoline engine coughed to life and started to operate. One could hear the engine’s sound and the car’s whole body vibrated as if something was broken, but the seller assured us that everything was as it should. The car actually has an electric motor and a microscopically small battery, but they are only used to start the petrol engine – the electric motor does not drive the wheels. The petrol engine then uses a tank full of gasoline, a fossil liquid, to propel the car by exploding small drops of it. It is apparently the small explosions that you hear and feel when the engine is running. The petrol engine consists of literally hundreds of moving parts that must have tolerance of hundredths of a millimeter to function. We begun to understand why it is car repair shops that sell the cars – they might hope for something to break in the car that they can mend? We put in a gear and drove away with a jerk. The jerk came not from any extreme acceleration, but gasoline engines apparently cannot be driven as smoothly as electric motors. The acceleration did not occur at all, because we could not get the car to go faster than 40 km/h! By then the petrol engine literally howled and the whole car shook violently. Convinced that something must have broken we stopped the car. The seller then explained that with petrol engines you need to ”change gears” on a regular basis. Between the engine and the wheels are not a fixed ratio gear, but a variable one. The petrol engine can produce power only in a limited speed range, and must therefore be geared with different ratios in order to continue to accelerate. There are 5 different gears we can select with increasing speed as result. It is -as we learned quickly- very important that each time select a suitable gear otherwise the engine will either stop or get seriously damaged! You need a lot of training to learn to select the right gear at the right time – though there are also models with automatic transmissions that can do this themselves. In the manual transmission car, we needed to constantly guard the engine from damaging it. Very stressful. We asked if the constant sound of the engine -that frankly disturbed us from being able to listen to the radio- could be turned off. But it couldn’t. Very distracting. After getting the car up to speed through intricate changing of gears we approached a traffic light. Releasing the accelerator pedal resulted in no significant braking, we had to use the brake pedal very much to slow down the car. We were surprised to hear the brakes are completely mechanical! The only thing they generate is heat – braking gives no regeneration of gasoline back into the tank! Sounds like a huge waste, but it would soon get even worse. When we came to a stop the engine continued to run and the car vibrate – even though the car was standing still! The engine continued to burn gasoline without moving the car forward. Can it really be true? Yes, the seller explained, it is so with gasoline cars: the engine is always running and burning gasoline – even when the car is stationary. Some models however switches off the engine at a red light, he explained. Well that certainly makes more sense. After a while we came to a gas station where we could charge the car. The car claimed that it still had half a tank left, but we wanted to try the famous super-fast charging of petrol cars! So we drove to the gas station and opened the fuel cap. The filling nozzle is very similar to a charging connector, but it is not electrons that come out of it but gasoline. Gasoline is a highly carcinogenic, smelly and flammable liquid derived from plants and animals extinct since millions of years ago. The gasoline is pumped to a tank in the car, which then drives around with about 50 liters of this hazardous liquid in it. We put the nozzle to the car, but nothing happened. The seller then explained that we must pay to fuel! Much like those extremely expensive fast chargers some electric utility companies have set up. After we put the credit card in the reader we could start fueling. It was extremely fast! In just two minutes we filled the gas tank to the max! But there were two counters on the pump: one that showed the number of liters we have fueled and one that showed how much it would cost us. And that counter was spinning so fast that we could hardly keep up with its pace! Sure we filled the tank full in two minutes, but it did cost us an unbelievable €30! 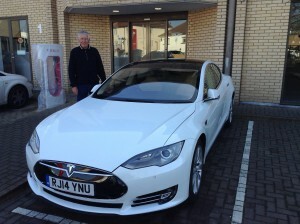 A full charge would thus cost us double that – a whopping €60! We cursed our luck that we apparently have chosen one of the most expensive gas stations, and began to ask the seller what other alternatives are there? How much does it cost to fill up at home, and how many free stations are there? The seller looked very puzzled at us and explained that it is not possible to refuel gasoline cars at home, and there are no free gas stations. We tried to explain our questions, in case he had misunderstood, but he insisted that you can not. Apparently you have to several times a month drive to the gas station to recharge your petrol car at extortionate prices – there are no alternatives! We thought it was very strange that no gasoline car manufacturers have launched their own free gas stations? There are no gas stations either where you can fill up more slowly at a cheaper price. We started calculating price versus consumption and came to the shocking conclusion that a petrol car costs unimaginable €12 per 100km! Sure, electric cars could also theoretically come up to these amounts if they quick charged at one of the most expensive charging stations in the country – but for petrol cars there are no cheaper alternatives! While electric cars are comfortably charged at home every night for €2 per 100km petrol cars must make detours several times a month to fill up at these extortionate rates – without exception! Monthly cost for a petrol car can -just for the gasoline alone- easily exceed one hundred Euros! We begun to understand why they are so cheap to purchase – operating them is extremely expensive instead. We also begun to understand why there must be so many petrol stations everywhere, if all petrol cars always have to drive to them to refuel. Imagine if you could charge your electric car only at the power companies’ most expensive fast chargers – and nowhere else! With this in mind we ended up in a traffic jam and was horrified that the gasoline engine continued to burn these expensive gasoline drops even when the car was standing still or moving very little. With gasoline vehicles it is easy to run into cost anxiety – the feeling that the car literally burns up your money! No cheap home charging and no regeneration of gasoline back to the fuel tank when braking sounds like economic madness – especially given that all gasoline must be imported from abroad. We returned the car to the dealer’s premises, pulled the handbrake and step out of the car. The petrol engine continued to run! Apparently one must manually switch off the combustion of the precious liquid. But we wanted to see the petrol engine, so the seller opened the bonnet. The entire front portion of the car was completely cluttered with hoses, fittings, fluid reservoirs, and amid all a huge shaking cast iron block which apparently constituted the motor’s frame. There was no space for luggage in the front of the car! Despite its enormous size, high noise and vibration, the engine barely delivered one hundred horsepower. The engine was also extremely hot, we burned ourselves when we touched it. Even though this was on a warm summer day so the engine did not need to generate heat to the passenger compartment. We became also worried about what would happen if we crashed with a petrol car? The cast iron block that occupied most of the engine compartment was sitting in the middle of the collision zone! Where would it go if we collided – would we get it in our lap? The salesman assured us that the motor in such case somehow gets folded down under the car but we could not escape the impression that the engine block was very much in the way at the front – the safety beams were built around it, which surely impairs their functionality. Avoiding that one hundred kilo iron lump in the front of the car makes it so much easier to build safe cars. In addition, we have seen on the Internet hundreds of pictures and videos of burning gasoline cars. The petrol tank apparently often leaks after an accident so the flammable liquid pours out and becomes ignited! From the engine, under the car runs an exhaust system – a kind of chimney for engine exhausts. When you burn the carcinogenic gasoline a lots of noxious gases are produced. The car cleans away the most dangerous gases, but what remains is released into the open air behind the car. It is still unhealthy to breathe in – and smells very bad! And petrol cars are allowed to emit these harmful gases in the middle of our cities? Do not confuse petrol cars’ exhaust pipes with fuel cell cars’ – while hydrogen powered fuel cell vehicles emit only water vapor gasoline cars spew out noxious gasses, and even fossil carbon dioxide that contribute to Earth’s future-catastrophic warming! We thanked the seller for the display, shook our heads and gave back the ignition key (yes, it’s called that) to him. He realized that there would be no business for him so except for one lame attempt he did not try to sell us the car any more. On the way home in our electric car we looked with completely different eyes at our poor fellow commuters, who still had to put up with their gasoline cars. But soon it will be their turn to trade up, too! "I heard a little snippet from the VW fallout that rather excited me. There is a rumour that they have a peoples photo-type electric car similar in concept to the launch of the beetle many years ago. The price and performance would make this available to millions more motorists and revolutionise the car industry overnight. VW you have sinned but this is your moment in time to put that behind you and do something amazing for us all. “Beetle Electric the new people’s car”, could it be true ? " "A very interesting take on the situation. I agree, petrol cars are so old fashioned. " Are Americans bright or just caught in the headlights ? Consumers in the United States bought automobiles in the four months from May through August at the fastest clip in more than a decade, propelled by strong appetite for trucks, sport utility vehicles and crossover models and by low gas prices. Light-vehicle sales for August surpassed 17 million units for the fourth month in a row, measured at an annualized, seasonally adjusted rate, according to automotive data company WardsAuto. The last time that happened was 2000, the firm said. Compared against August last year, total sales were down less than half a percent for all light-duty vehicles, and light car sales were down about 10 percent. But light-duty truck sales—up a little more than 8 percent for the month, despite the fact that Labor Day sales will be counted in September—pushed some models to record sales totals and buoyed results overall. Like cross-town rival Ford, which saw sales of its brawny Mustang and immense Lincoln Navigator models jump 70 percent or more, General Motors Co. and Fiat Chrysler, the smallest by market share of the former U.S.-owned and so-called “Big Three,” reported sharp increases in demand for many of their largest vehicles. General Motors sold more than a quarter of a million cars in August, down from the same month last year, but buyers snapped up Chevrolets, pushing the brand’s truck sales up for the 16th month straight. Sales for Chevrolet’s Silverado climbed 20 percent, and Tahoe deliveries rose 5 percent; it was the best performance for both models since 2008. And GMC, the maker of freight-hauling, burly pickups, had its best month since 2005, the company said. Fiat Chrysler also reported a monthly gain: The company’s U.S. division had its best August since 2002, as eight Fiat Chrysler cars sold in the country set sales records. “In spite of a tough 2014 comparison and extreme stock market volatility, our dealer’s competitive spirit kicked in and propelled us to our 65th-consecutive month of year-over-year sales increases,” Reid Bigland, the head of U.S. sales for Fiat-Chrysler, said in a statement. “All of the economic fundamentals that we look at, including job growth, disposable income and fuel prices, are in good shape and that should keep sales strong,” Kurt McNeil, vice president of General Motors’ U.S. sales operations, said in a statement. Sales at Toyota Motor Corp., the third-largest player in the U.S. market, declined about 9 percent. Economists consider rising demand for and orders of durable goods—items expected for work for three years or more, such as appliances, furniture, heavy machinery and vehicles—as an indication of improving consumer sentiment and a rosier economy. And wings of the federal government haven’t overlooked the industry’s growth and brisk business. The U.S. Department of Commerce said Wednesday that new orders of manufactured goods rose in July by 0.4 percent. Transportation equipment—including light trucks, utility vehicles, heavy trucks, and vehicle bodies, parts and trailers—fueled an increase with a 5.5 percent gain in new factory orders. Shipments of transportation equipment, which climbed about 3 percent in July, pushed up shipments nationwide. According to Commerce Department data, heavy-duty truck sales in June and August this year reached their highest volume since January 2007, before the global financial collapse. And the Bureau of Labor Statistics said Friday that businesses that produce and maintain motor vehicles and parts added about 6,000 jobs in August alone. In the same report, officials from the Federal Reserve Bank of Kansas City, which covers central Plains states between Wyoming and New Mexico and Missouri and Colorado, described flagging interest for more fuel-efficient cars. The latest figures from the Electric Drive Transportation Association, a trade group that advocates electric, electric-hybrid and fuel-cell car technology and infrastructure, reveal a diminished share of the car market. Cars that either partially or entirely use electricity to function make up slightly more than 3 percent of the U.S. auto market, the lowest share since 2011 and a sharp contraction from 3.5 percent last year, according to EDTA. Meanwhile, the AAA motor club predicted in a statement called “Gas Prices Under $2 on the Way” that drivers over the Labor Day holiday weekend would pay the lowest gas prices since 2004. In the winter months, when there are fewer drivers on the roads and refineries are typically finished with autumn maintenance, gas prices could dip below $2 per gallon by Christmas, AAA said in an August report. Americans are also driving more, whether or not they’re directly influenced by low prices at the pump. The Federal Highway Administration, housed within the Department of Transportation, said in mid-August that Americans drove more in the first half of the year than ever before in the same time period. U.S. drivers covered 1.54 trillion miles in their cars from January through June, besting the previous record of 1.5 trillion miles set in June 2007. “This is more than double the amount driven during the same period in 1981, continuing a trend of America’s driving mileage doubling nearly every generation,” FHWA said. “Americans have never been the brightest bulbs in the bin when it comes to buying cars and that is playing out once again. After years of being informed of the devastating impact of burning fossil fuels US consumers, now presented with the gift of cheap oil, are buying gas guzzlers at a record pace. This is like getting on the scale and seeing that you’ve lost a pound and therefore deciding to eat nothing but cheese cake for the next month.” "
Lightsource Renewable Energy invited visitors for a very special behind-the-scenes look at look at Manor Farm solar farm, in Dorset, as part of the Solar Independence Day celebrations. Visitors of all ages and from all walks of life – from school children and wildlife groups to farmers and local politicians – were given guided tours of the park to see first-hand the benefits of solar energy. Once a solar farm is installed, members of the public rarely get a chance to step foot inside the gates, but the event gave people a chance to get a better understanding of how a solar farm works, the impact on the land and improvements to biodiversity that can be made. Installed in just six weeks, the 25-acre solar farm solar farm is now capable of providing locally-sourced, renewable energy to 1,400 homes – roughly a third of the homes found in nearby Gillingham. Lightsource has put into action a planting and landscape plan at Manor Farm, which provides numerous benefits to local biodiversity. The planting of new trees and shrubs around the site provides foraging habitats for local wildlife, while the new wild-flower meadow mix will offer a favourable environment to flying insects including bees, butterflies and dragonflies. Since its installation, the landowner has also reported an increase in the numbers of hares, raptors and hawks – a strong sign that wildlife is flourishing on site. Manor Farm was one of many solar farms, homes and commercial installations to open up to the public as part of Solar Independence Day, which also gave the public an insight into why “energy independence” in the UK is so important. Solar power can play a vital role in achieving this goal by reducing the UK dependence on importing polluting fossil fuels, in favour of generating clean “home-grown” energy. "Vince Adams of Letsgetenergized.co.uk and esvips.com comments: As the founder of letsgetenergized a portal that supports renewable energy I was fascinated by my visit.The remoteness of the site gave it a Cathedral like quiet only broken by the sound of distant traffic Not a sound was heard from the panels themselves with sheep grazing happily all around us the visit was rather special.To think that our future energy needs can come from Solar Farms rather than Power station belching out smoke and carbon 24 hours a day is remarkable. The small footprint that the site has with a small concreted area for the inverters to sit on and everything else instantly removable is amazing. Thanks to Lightsource and Liza for opening the site my only regret was missing the barbecue. " I have often been asked by people if my e car has a solar panel roof and the Nissan Leaf doesn’t have one. Why not ? wouldn’t it help add range to the car as it re-charges during the day ? 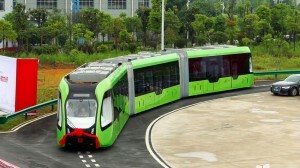 Anyway one Nigerian has proved it can work and has inspired the next generation of e car drivers. If you havn’t driven electric then test drive one of the many options of models over this Summer. We at Letsgetenergized plan to test as many new models as possible and post up our thoughts and assessment of each one. Oh and by the way did you see this weekend e grand prix in Battersea Park, you can watch it now on IPlayer, its great action and very much the future. This weekend the first year of the electric car grand prix season will climax at Battersea Park in central London. Exciting new technology developments and engineering make this just as exciting as its counterpart F1. The drivers are all top people from motor sport and in time we believe this cleaner and quieter racing will become a major World attraction. Maybe we can get some of the cars to come down to Dorset and get F1 enthusiasts involved with e transport in all its forms. 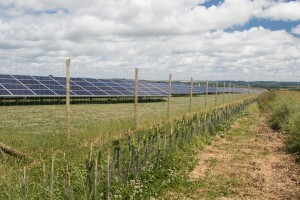 Your chance to visit a working Solar Farm and see for yourself whats going on under the panels. Please find attached an invitation to visit Race Solar Farm near Lytchett Matravers which will be open to the public to celebrate Solar Independence Day, on Saturday July 4th from 11 am to 3 pm. Solar Independence Day is the UK’s annual solar celebration showcasing solar homes, solar schools, commercial solar rooftops and solar homes. This is a great opportunity to learn more about the growing solar industry, how it works, what’s involved, as well as seeing it in action! The event is designed to raise awareness of the benefits of solar to you, your local community, and the UK as a whole, and the huge potential the technology has for safe, renewable and low carbon energy for the UK. If you would like to attend please register via Eventbrite, if you would like any further information feel free to contact the Solar Trade Association at enquiries@solar-trade.org.uk. Thank you for your support and we hope you enjoy Solar Independence Day! I’m an electric car freak but really its my interest in forward proofing that really gets my juices going. So its was with real excitement that I watched this video demonstrating the use of S T turned into hydrogen and fuelling a prototype Toyota car. Everything is possible folks you just have to support the future for our kids and their kids to live better lives and create a healthier Planet without the overuse of fossil fuels. Believe in the future my parents did and take TV look at what has happened over 50 years, from huge wooden boxes with hardly any screen to wonderful flat screen sets.